An RGB image, along with its separate R, G and B components; Note that the white snow consists of strong red, green and blue; the brown barn is composed of strong red and green with little blue; the dark green grass consists of strong green with little red or blue; and the light blue sky is composed of strong blue and moderately strong red and green. A set of primary colors, such as the sRGBprimaries, define a color triangle; only colors within this triangle can be reproduced by mixing the primary colors. Colors outside the color triangle are therefore shown here as gray. The primaries and the D65 white point of sRGB are shown. 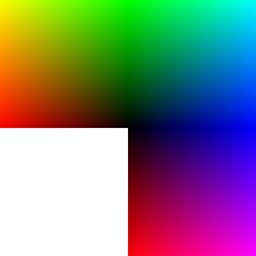 The RGB color model mapped to a cube. Values increase along the x-axis (red), y-axis (green) and z-axis (blue).